HotLok SwitchFix provides a passive network switch cooling solution to solve the cooling problems associated with network switch placement without the need for any additional energy usage. 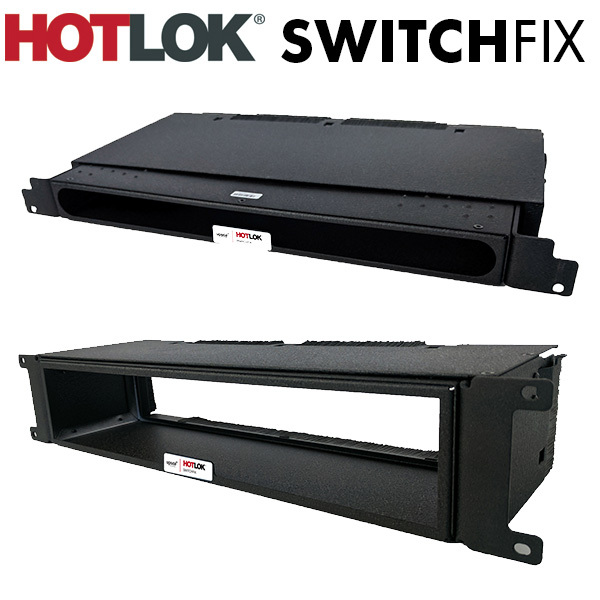 HotLok SwitchFix provides an effective cooling solution for network switches that are often placed in the top and back portion of a server rack. This placement makes it difficult for cold air from the cold aisle to travel from the front of the rack to the air intakes in the side or rear of the network switch. HotLok SwitchFix solves this problem by extending from the front of the rack in the cold aisle to the network switch mounted in the rear of the cabinet. This allows cold air from the cold aisle to reach the network switch for proper cooling. HotLok SwitchFix’s passive airflow system channels air from the cold aisle to the air intakes of the switch so that it can pass through the network switch to properly cool it. This channelling also prevents bypass and recirculated airflow and stops hot exhaust air from equipment passing through the network switch. This passive switch cooling solution can improve switch performance and life expectancy. HotLok SwitchFix comes in a variety of sizes to meet the needs of many switches currently used in today’s data centres and enterprise IT environments. Each unit adjusts in depth to ensure an optimal cold airflow through the installed network switch. SwitchFix can easily accommodate front, rear and side switch intakes and exhaust. Passive network switch cooling solution for switches with dual side intakes. Adjustable depth 711mm to 762mm (28”-30”). Designed to passively cool network switches with rear intakes, adjustable from 146mm to 216mm (5.75”-8.5”). Adjustable for rear intake network switches from 194mm to 295mm (7.63”-11.63”). Supports network switches with rear intakes. Unit adjusts from 254mm to 372mm (10”-14.63”). Channel rails adjust for depths from 711mm to 787mm (28”-31”). Passive cooling solution for switches with rear intakes. Adjusts from 270mm to 372mm (10.63”-14.63”). Unit is adjustable from 324mm to 533mm (12.75”-21”) with supporting channels which are adjustable for depths from 711mm to 762mm (28”-30”). This SwitchFix model supports network switches with rear intakes. HotLok SwitchFix that provides passive cooling for network switches with a single side air intake. 1U high with adjustable channel depths of 711mm to 762mm (28”-30”). 2U SwitchFix that supports rear intake network switches. Unit adjusts from 105mm to 146mm (4.15”-5.75”). Adjustable 2U SwitchFix for rear intake switches. Adjusts from 194mm to 295mm (7.63”-11.63”). Cools switches with rear air intakes. 2U high and adjustable from 270mm to 372mm (10.63”-14.63”). Channels cold air to network switch. Maintains cold aisle / hot aisle segregation. Adjustable for a variety of depths. Maintains switch reliability and improves longevity of the switch. Augments and improves upon airflow management best practices. The HotLok SwitchFix line supports over 200 switches in a passive application. No additional power supply is required for the passive units. Supports 1U and 2U switches, contact our sales team to determine the SwitchFix for your requirement.